This recipe is bought to you courtesy of Sam Quinn, Co-Founder of Woodfired Canteen – a Cornwall-based experience dining company. 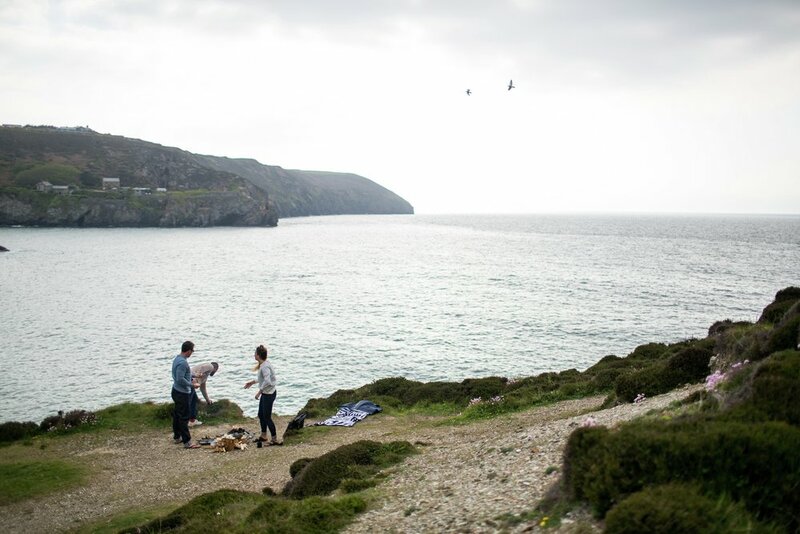 Woodfired Canteen is based at Wheal Kitty Workshops in St Agnes, an old mine-works and engine house perched on Cornish clifftops; they share the site with awesome adventure brand Finisterre, environmental charity Surfers Against Sewage and Walters surfboard shapers. 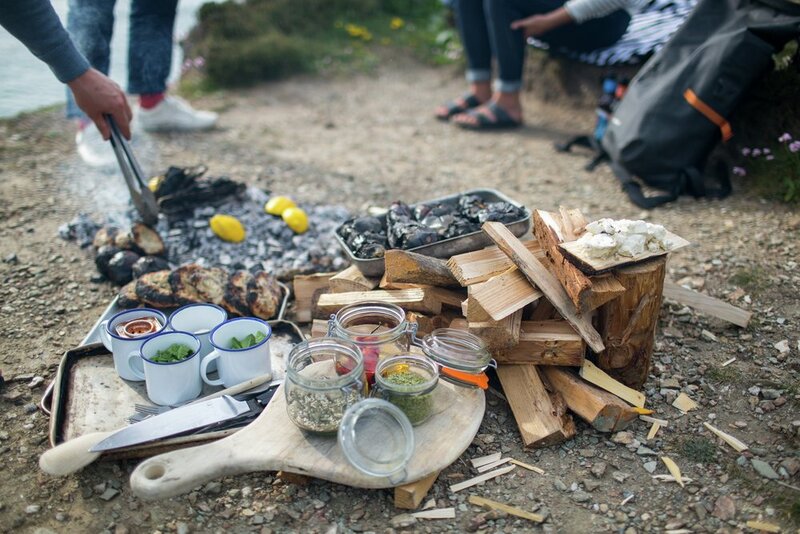 This recipe is perfect for an alfresco feast after a Cornish surfing session. Charred aubergines, salty wood smoked feta and the tang of cider-soaked chilli come together in this refreshing Middle Eastern inspired dish. 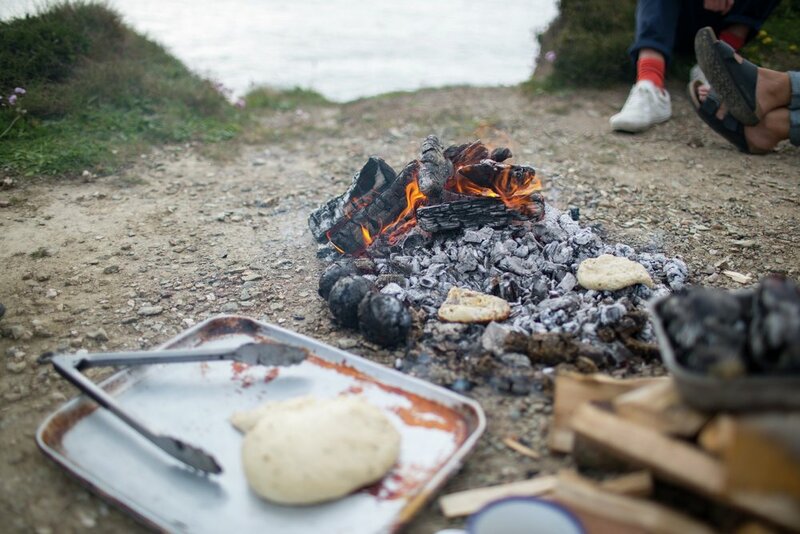 Make the dough in advance and prove it whilst you get the fire roaring - just leave it for half an hour whilst you take some time to explore the headlands or dive into the sea. Begin with two handfuls of kindling and start a ten-inch circumference fire. Once you hear the first cracks of woods, add four-inch-thick of hard wood keeping space for air to flow. Watch for these to catch - it should take about twenty minutes. Then add six-inch-thick pieces of hard wood, again making sure there is good air flow. After forty minutes the first coals should be ready in your fire. Divide the fire in half and place fresh hard wood on one side. Make sure this fire has regular pieces of hard wood added to it so that smokes rather than burns. Drag the coals from the fire, place the onions (skin on) on the coals, and turn every so often for up to an hour until the onions are soft to touch. Find a flat clean piece of hardwood and place the feta on top - place this wood on the periphery of the fire next to some hot coals, allow them to scorch the wood causing them to smoulder and smoke the cheese. This may take up to 10 minutes. During this time, make your bread. Mix all the ingredients except the salt, knead together for five minutes until the dough has stopped being tacky or sticky and allow to rise in a warm place. When doubled in size (in about 40 minutes) knock back and season with the salt. Place the aubergine on top of the fire and burn until soft to the touch (10 mins). Set aside the aubergine and now you can start on the dressing. Simply peel onions (be careful as they retain their heat). Cut those up into small pieces, dress with cider vinegar, a little chilli diced up (or infuse the vinegar), salt and rosemary, a squeeze of lemon juice (placed on coals if desired), picked mint and coriander; then slice the aubergine and liberally dress the inside with the dressed ash salsa. Crumble the feta over the top of the aubergine and finish with good olive oil. The za’atar is the last thing to dress the aubergine before serving up to your friends to give the dish that little bit extra.